How exactly has San Francisco’s urban landscape changed in the hundred years since the earthquake and cataclysmic firestorms that destroyed three-quarters of the city in 1906? 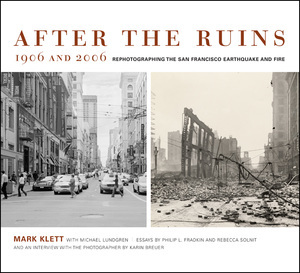 For this provocative rephotography project, bringing past and present into dynamic juxtaposition, renowned photographer Mark Klett has gone to the same locations pictured in forty-five compelling historic photographs taken in the days following the 1906 earthquake and fires and precisely duplicated each photograph’s vantage point. The result is an elegant and powerful comparison that challenges our preconceptions about time, history, and culture. “I think the pictures ask us to become aware of the extraordinary qualities of our own distinct moment in time. But it is a realization that a particular future is not guaranteed by the flow of time in any given direction.” So says Mark Klett discussing this multilayered project in an illuminating interview included in this lavishly produced volume, which accompanies an exhibition at The Fine Arts Museums of San Francisco. 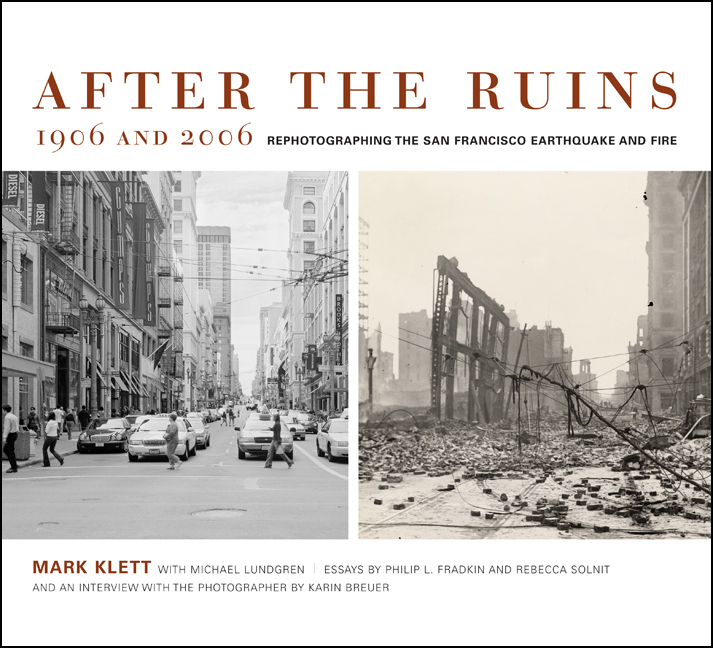 After the Ruins, 1906 and 2006 features a vivid essay by noted environmental historian Philip Fradkin on the events surrounding and following the 1906 earthquake, which he describes as “the equivalent of an intensive, three-day bombing raid, complete with many tons of dynamite that acted as incendiary devices.” A lyrical essay by acclaimed writer Rebecca Solnit considers the meaning of ruins, resurrection, and the evolving geography and history of San Francisco. Mark Klett, Regent’s Professor of Art at Arizona State University, is author of eleven books of photography, among them Third View: A Rephotographic Survey of the American West (2004), Revealing Territory (1992), and One City/Two Visions: San Francisco Panoramas 1878 and 1990 (1990). His photographs have been shown and are in the permanent collections of the Whitney Museum of American Art, the Los Angeles County Museum of Art, the Oakland Museum of California, and the Huntington Library. Philip Fradkin is author of ten acclaimed books on the American West including The Great Earthquake and Firestorms of 1906: How San Francisco Nearly Destroyed Itself (California 2004) and The Seven States of California (California, 1997). He shared a Pulitzer Prize while at the Los Angeles Times. Rebecca Solnit’s previous books include River of Shadows: Eadweard Muybridge and the Technological Wild West (2003), winner of the 2003 National Book Critic’s Circle Award, Wanderlust: A History of Walking (2001), and Savage Dreams: A Journey into the Landscape Wars of the American West (California, 1999).